The pitches in musical scales are likely derived from language. Turns out, aspects of spoken English and Mandarin correlate to the intervals between notes in a chromatic scale (the black and white piano keys in an octave). Unfortunately, there’s nothing more than this offered as proof. What a bold statement to make but then not back up. Anyone out there know anything about this or where to get more details on this? 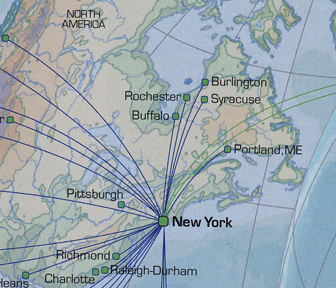 I’ve noticed three interesting things in New York over the past few weeks. 1) I don’t get nearly as much junk mail as I used to. In fact, a few days this week I’ve had no mail at all (don’t know if that should make me happy or sad). My guess is that the credit card companies are cutting down on their marketing budgets to keep profits high. 2) There are a bunch of billboards for rent near me – including a couple down in the meatpacking district that are about as good as they get for location. 3) They just can’t seem to lease space in Chelsea Market right now. There are a bunch of shops that have gone under and not been replaced. These are anecdotes, and the plural of anecdote is not data, but is America’s “recession that isn’t” finally coming to NYC? Posted on June 26, 2008 Author adminCategories NYCTags economy, NYCLeave a comment on Hard Times A’Coming? One of the most fascinating scientific developments of the past 20 years has been the emergence of the field of complexity. With the advent of computers, scientists can now model massively complex systems – many of which tend to form from remarkably simple interactions. A case in point was revealed in a New York Times article on cellphone tracking. The article summarized a recent letter to Nature magazine, understanding individual human mobility patterns (PDF). Previous studies of human mobility had used the sighting of banknotes in the same geography (via Where’s George) as a proxy for human mobility. The conclusion: humanity’s movement was random, following a fat-tailed Levy distribution (a lot of movements of short distances but more long distance movements than you’d expect). However, the new study actually tracked people’s movements based upon their cellphones (data was anonymized and from a European provider who is required by law to track). What’s the new conclusion: humans don’t actually travel too far on average and our movements are actually highly predictable (Not too surprising given how much of your time is spent at work or home). How do you reconcile the random movement of money with the predictable movement of humans? Simple “dollar bills diffuse, but humans do not” – the dollar bills do not travel with each human daily, rather are passed on. As a result a bunch of humans who do very predictable things can cause apparently random patterns to emerge in the movement of money. This is a classic example of complexity: a series of simple actions create a ridiculously complex pattern at an aggregate level. Fascinating science and kind of makes me want to be an undergrad again. Unless you live under a rock, you probably know that the Celtics blew away the Lakers in Game 6 of the NBA finals to win their 17th championship – and first in 22 years. A lot has been made about the structure of the team and how management built a team around the three stars of Paul Pierce, Kevin Garnett and Ray Allen. What’s equally interesting is what goes on away from the parquet. The team is owned by a syndicate of 25 financiers, mostly venture capitalists and private equity veterans. What does this mean? Well, they’re fiercely competitive but also metrics driven. Maybe that’s why they crunch the numbers on every datapoint they can get about their competition and essentially model how the team should react to different teams and players. You’re never going to win in sport without great players – but great players alone aren’t going to beat a team that hustles this hard off the court. From what I can tell, Rochester has moved over to be Eastmain, Nunavut. Burlington is Lac Guillaume-Delisle and Syracuse is Lac Bienville (ironically, I don’t even think there’s a road within 100 km of Lac Bienville). 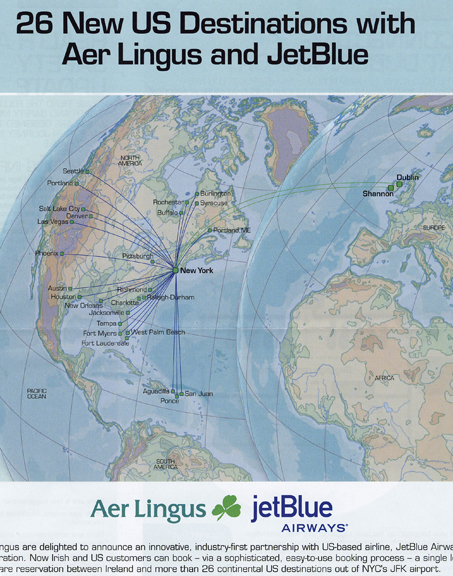 This map would be really funny except for the fact that Aer Lingus is an airline and there job is to actually know where places are.